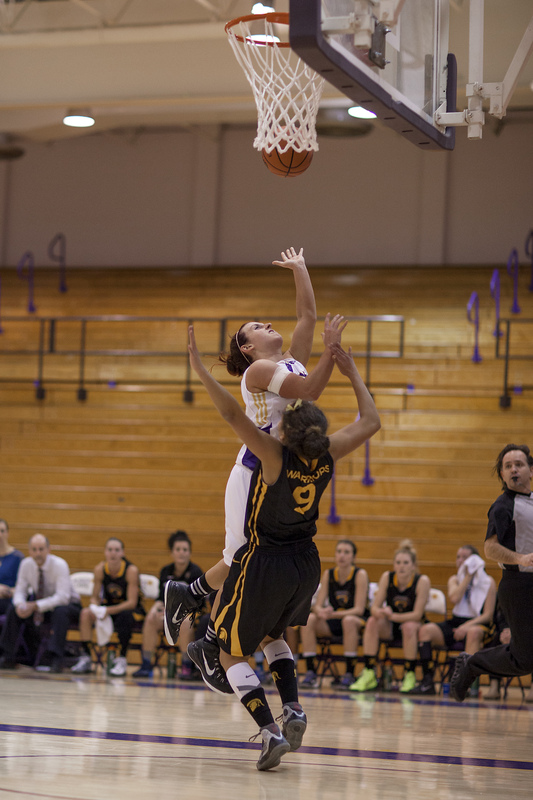 85 days after their home-opening loss to the Ryerson Rams, the Wilfrid Laurier University women’s basketball team felt the sting of defeat for the second time in the 2014-15 season, falling to 12-2. This time it came at the hands of the ninth-ranked Lakehead Thunderwolves, led by their fifth-year superstar Jylisa Williams, who dropped 36 large on the Hawks on Saturday. The final tally saw the Thunderwolves walk away with a 73-59 victory, pushing them to 11-3. The Hawks toppled the Waterloo Warriors by a score of 60-47 earlier in the week for their twelfth-straight win before heading to Thunder Bay. Third-year guard Kaitlyn Schenck pitched in with 15 in that contest and was satisfied with the team’s performance. “Everything is working for us. We are pounding it inside when we need to, we are kicking it out when we need to, we are playing amazing team defence, we are playing for a solid unit, a solid team, so that’s really our key to success,” she said. However, head coach Paul Falco knew there were improvements to be made before attempting to take on the top player in the country. “I think we had a lot of good looks that didn’t go down. I think we have to be a lot stronger with our takes. We need more movement in our offence. It was too stagnant at times,” he said following the win. Unfortunately for the Hawks, the adjustments made were simply not enough to contain Williams as she had her way with the Hawks defence on Saturday. 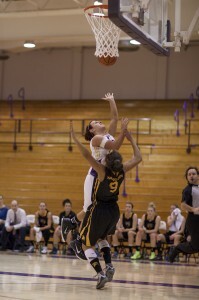 In addition to her point total, she grabbed 16 rebounds, including three on the offensive side of the floor. “She had heck of a game. She made some difficult shots with hands in her face. One of the things we wanted to limit were her transition hoops, but we were not able to do that consistently enough,” said Falco. Williams is averaging nearly a double-double this season with averages of 28 points and 9.7 boards per game. She also leads the league in free throw attempts and field goals made and is second in steals with 49. Falco had a plan to help stop Williams, but joked that maybe a little luck may necessary in stopping the Thunderwolves star guard. “I think one thing we could do is maybe have her show up two hours late and miss the game,” he said. With the loss in their rear-view mirror and the streak extinguished, the club will attempt to turn their focus to what has been working for them throughout the entire season — trying to make incremental changes with each coming week. “There’s always little improvements to be made. We can talk more on defence, we can do little things on offence,” said Schenck. According to Falco, the end of the end of the 12 game stretch does not change the game plan going forward. We haven’t really talked about the streak as much as we have talked about getting better month after month, week by week,” said Falco. After a season with multiple road games, the Hawks will now head back to the Athletic Complex for a four-game homestand including two games against the Algoma Thunderbirds and contests against Laurentian and Nipissing. They then head to London for a game against the Western Mustangs and wrap up their season against the number one Windsor Lancers at home. “We’ve talked all year about not worrying about who we are playing but worrying about how we are playing and playing with the same intensity no matter who we are matched up against,” said Falco.